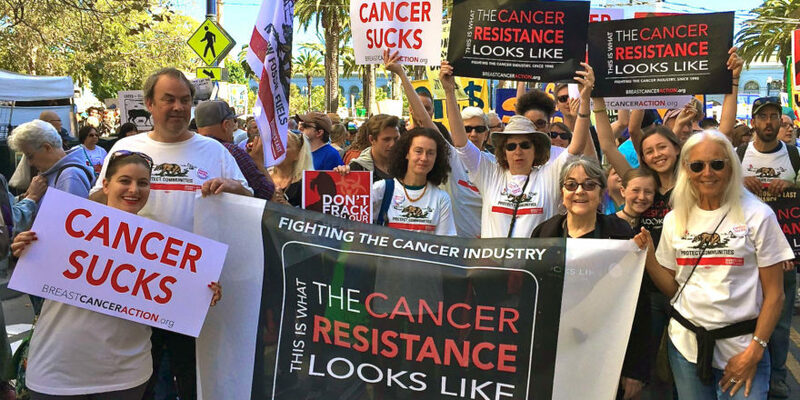 SAN FRANCISCO, CA: Breast Cancer Action (BCAction), the national watchdog for the breast cancer movement, will be leading a march in the streets of Philadelphia the day before the Democratic National Convention to call attention to the health harms of fracking and dangerous drilling. Staff, community members, and allies are marching together in a health contingent as part of the March for a Clean Energy Revolution, which is calling on elected leaders to ban fracking and other oil and gas processes that use chemicals linked to breast cancer and other diseases and disorders. Fracking and dangerous drilling are urgent public health and social justice issues, which use hundreds of chemicals in its process of extracting oil and gas. These chemicals—25 percent of which are linked to cancer—have been found to contaminate drinking water sources, pollute the air, and ultimately harm people’s health. “Dangerous drilling and fracking harms the climate and our health. We cannot separate one from the other,” said Karuna Jaggar, the executive director of Breast Cancer Action. Despite the known health harms linked to many of the 700 chemicals commonly used in dangerous drilling—chemicals which include carcinogens, neurotoxins, hormone disruptors, plastics, heavy metals and radioactive agents—the nation’s politicians are failing to protect public health by banning these inherently toxic practices. 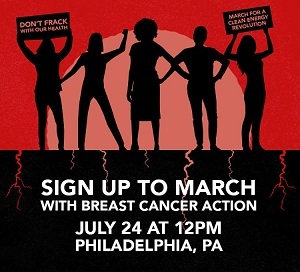 BCAction will be leading the health contingent of the March for a Clean Energy Revolution beginning at Philadelphia City Hall on Sunday, July 24, at 12PM. The March for a Clean Energy Revolution is being held by Americans Against Fracking, a coalition of organizations that support a national ban on fracking. The demands for the march include banning fracking now, stopping dirty energy and attaining environmental justice for all. The march is expected to draw thousands of people from across the country on the eve of the Democratic National Convention.